Gov. Paul LePage dispensed a giant check for $9.4 million to the staff at Inland Hospital today during an appearance to mark the repayment of a $9.5 million debt from the state to the hospital. WATERVILLE — Gov. 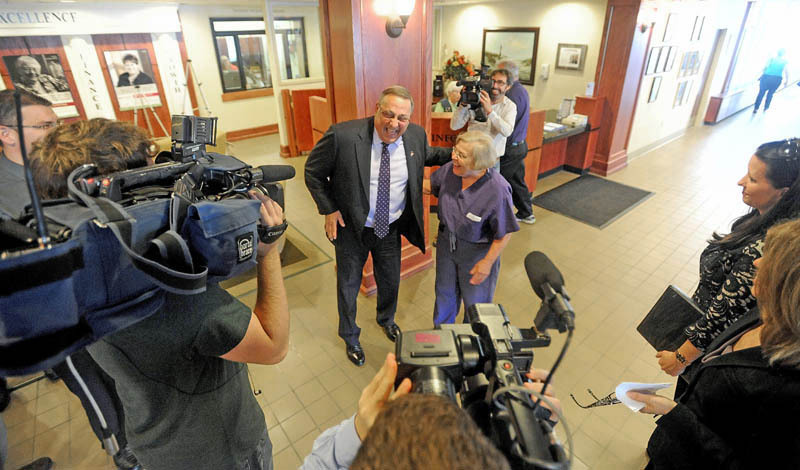 Paul LePage dispensed hugs, kisses, and a giant novelty check for $9.4 million to the staff at Inland Hospital Wednesday during an appearance to mark the repayment of a debt from the state to Maine’s 39 hospitals. The Eastern Maine Healthcare System, which includes Inland, received $106,670,228 this week in repayment of debts that were racked up by the state’s MaineCare system during the past 10 years. Maine’s 39 hospitals are receiving $183.5 million in payments from the state this week. The payment also unlocks about $300 million in federal payments that will now be paid to the hospitals. 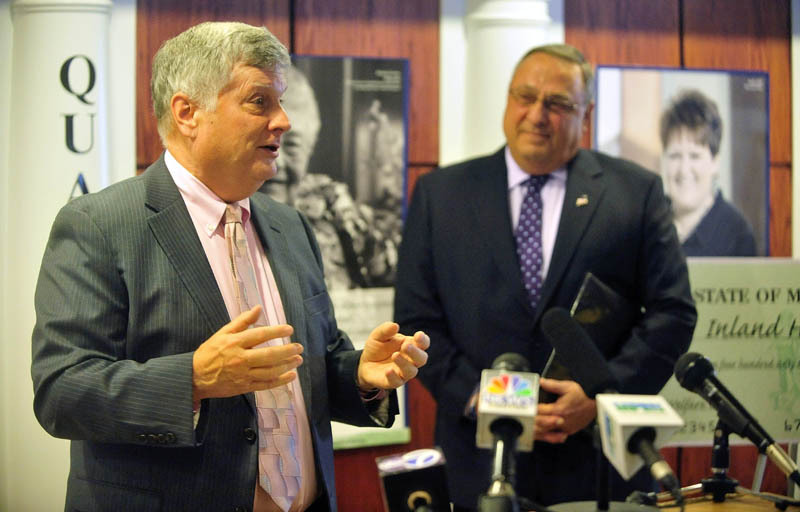 John Dalton, Inland’s president and chief executive officer, thanked LePage, who has championed the cause since he first began campaigning for the state’s top office. The repayment has been one of LePage’s top priorities for this legislative session; earlier this year, he refused to release $105 million in voter-approved bonds until lawmakers passed the repayment plan. Dalton said the money is not a windfall for Inland, but puts right a situation that the hospital hadn’t planned for. “We had to borrow money for minor projects and incur interest costs, and were forced to access our line of credit to meet ongoing current expenses like payroll,” he said. After the event, Dalton said the long-standing debts of the hospitals were beginning to raise the eyebrows of auditors, who questioned whether the money was recoverable. Of the other six hospitals in the Eastern Maine Healthcare System, Sebasticook Valley Health in Pittsfield is receiving $1.05 million this week, Acadia Medical Center in Bangor, $7.4 million; Aroostook Medical Center in Presque Isle, $12 million; Blue Hill Memorial Hospital in Blue Hill, $743,000; Charles A. Dean Memorial Hospital in Greenville, $1.2 million; and Eastern Maine Medical Center in Bangor, $74.7. Of the $9.4 million Inland is receiving, $4.5 million will go toward paying down the hospital’s line of credit with TD Bank, Dalton said. About one million is being spent on the ongoing $5.5 million renovation of Inland’s medical-surgical unit, which is scheduled to be completed next month. About $750,000 will go to fund other capital projects, and about $250,000 will be used to convert Inland’s boilers to natural gas, which he said will produce a further savings of at least $150,000 per year. The balance, about $3 million, will go into the hospital’s savings, Dalton said. Other hospitals in central Maine have said they plan to use the money to pay down debt, invest in new technologies and begin capital improvement projects of their own. At MaineGeneral Health, which is receiving $38 million this week, officials have said the money will go toward a combination of debt payment, savings, and furthering the $312 million project to build a new regional hospital in Augusta. Officials at the Franklin Community Health Network in Farmington said that $15.4 million in repayment would allow it to invest in new technology and pay off one third of a $25 million mortgage. 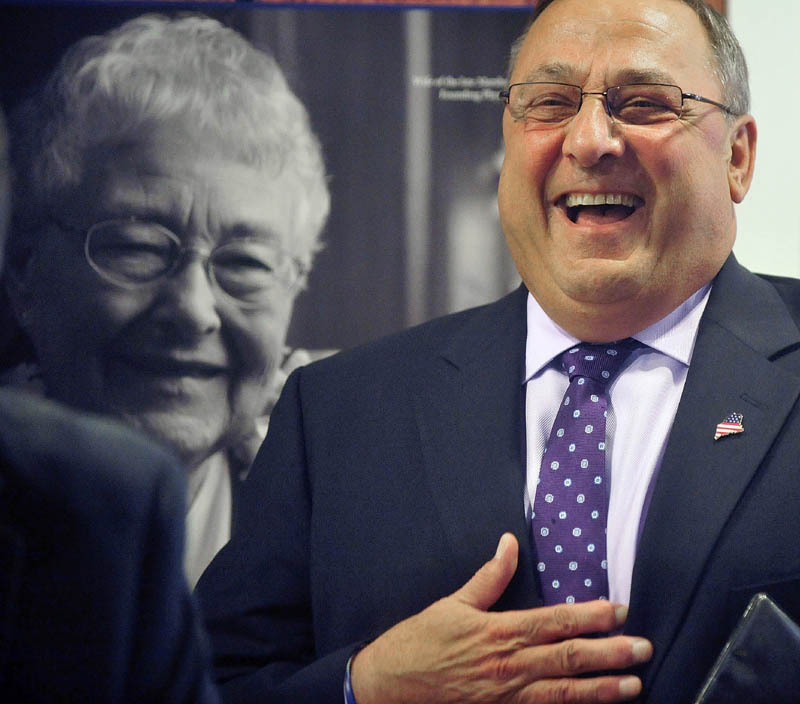 After his remarks, LePage toured the medical-surgical unit, and joked with hospital staff, many of whom he knew from his term as mayor of Waterville. 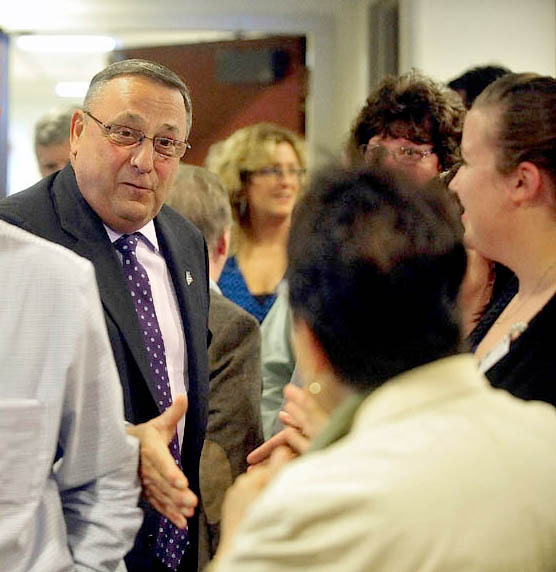 LePage exchanged high fives, kisses, and warm hugs with several people, including Joyce Stein, a Doctor of Osteopathic medicine in the hospital’s Obstetrics and Gynecology unit.